Gondola shelving is one of the world’s most widely used and versatile merchandise display systems. The core components are a flat base and a vertical stand which can be fitted with shelves, hooks, notches or pegboards. This makes it suitable for all retail industries and almost any products. Sold by length in detachable components, any store no matter how big or small can make use of gondola shelving. Its core strength lies in adaptability. The same length can simultaneously display shelved goods, products hanging from hooks and merchandise studded into pegboards. Being able to use the same equipment for any product saves both time and money when changing shop displays. Because of all its advantages, gondola shelves have become ubiquitous and widely deployed in almost every store. Rather than churning out the same models for every situation, Wiredex provides tailored answers that specifically address your needs. One of the big benefits is that our shelving will always enhance, rather than distract from, the product display. Evidence shows that when a shelf doesn’t fit the space, or if it’s not clearly branded or equipped to handle other items, sales will decrease. Wiredex completely eliminates this issue by delivering specialised solutions every time. If you’re looking for a flexible way to take advantage of underutilised floor space or store corners, we can provide non-standard gondola shelving lengths and shapes to make the most of it, all while maintaining a consistent store image and branding message. This is less of an issue in large supermarkets and department stores, but any small retailer will get increased sales with a customised gondola shelving solution. Furthermore, Wiredex tailored solutions are a great money-saver. Our gondola shelving systems come at competitive industry prices, while delivering solutions above and beyond the norm. Switching between shelves, pegboards and hooks is intuitive, straightforward and efficient. Because we’ve built all these components according to both your needs and the highest international standards, you’ll never have to worry about ill-fitting parts or poorly attached shelf extremities. As such, we’ve eliminated all extraneous maintenance costs. Every time you enjoy the superior efficiency and improved functionality of a specialised Wiredex gondola shelf, you know you’ve gotten top of the line functionality at no extra cost. Throughout its lifespan, the same length of gondola shelving might carry everything from car parts to cookies, including products that are potentially corrosive, toxic, staining or just plain sticky. Whatever the shelf is going to face, we can make it ready with our range of metal finishes, including electroplating, zinc dip galvanising and powder coating. This gives you an unparalleled degree of control over the final shelf appearance and functionality. Depending on your needs, we can offer a complete selection of rust proof, anti-corrosion, long life, scratch-free and chemically neutral solutions, with a full range of colours, designs and aesthetic considerations. Most shelving suppliers get this done elsewhere and then pass the cost on to you. At Wiredex, however, we have the experience and the facilities to get it all done in house, meaning we can offer top of the line services at no extra cost. 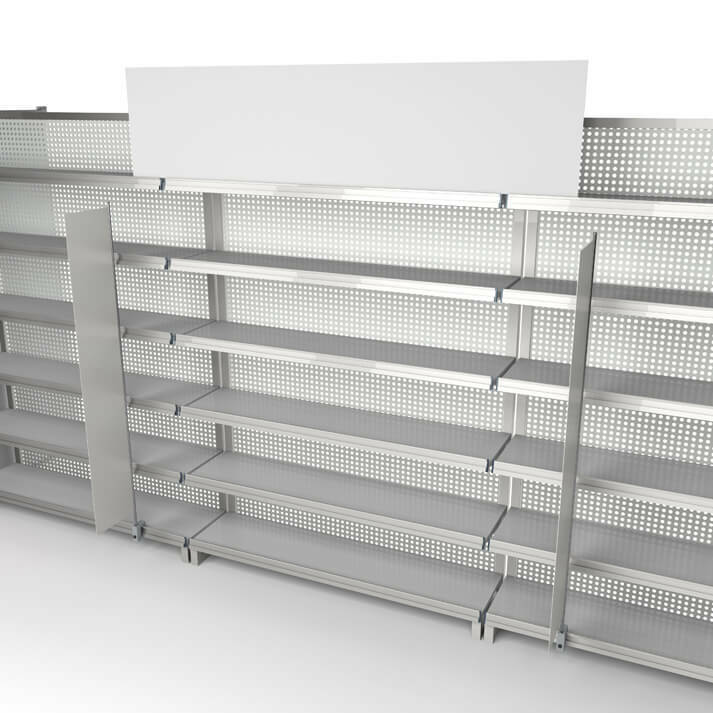 Wiredex offers high end, fully customised gondola shelving with a complete range of metal treatment options. We have the experience, the facilities and the means to make sure you get top-grade, world class merchandise display systems at a standard price. If you’re in Australia, there’s no reason to go anywhere else. Contact us online to start enjoying the Wiredex advantage today.